If elected, I will run this country into the ground! 2004 update: I was going to redo the map for 2004, but other people have already done it. Salon has this feature called "Red vs. Blue" in which they fill up virtual column inches by printing letters from people who are angry about the 2000 presidential election. The title comes from the rather striking effect you see when you look at a map of how the states voted in the Electoral College. The idea is that there is this festering gulf between the folks in northern states and those in southern states. The problem with this idea is that it assumes that the people in a given state went all-out for the candidate who ended up winning that state. As my map below demonstrates, this is not the case. How I did it: I used CNN's election results. Using the GIMP I made a 100-pixel-wide gradient from the "red" color on Salon's map to the "blue" color on Salon's map. That was Gore's gradient, the one shown on the legend. I flipped it around to get Bush's gradient (just for convenience, since the election results put the winner of the race in a state first on the list). I colored each state according to how many percentage points the winning candidate won in that state. 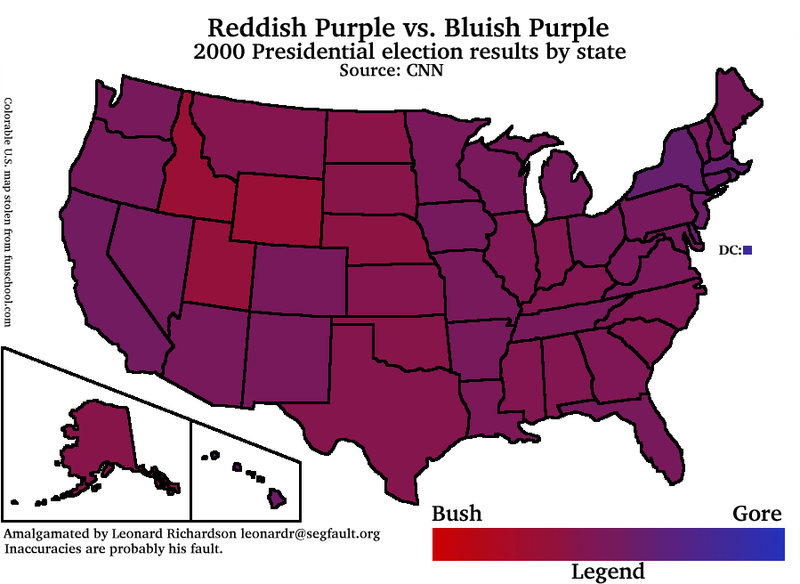 For example, Bush got 58% of the vote in Montana, so I picked the 58th pixel from the left in Bush's gradient and used that color to color Montana. For the nine states in which the winning candidate won only a plurality, I mapped the difference between the two candidates' percentages (usually a whopping 0%) onto the winner's gradient. In retrospect, I probably should have done it this way for every state to compensate for the effect of third parties. Not that it would have mattered much. Color using these colors the map of the US normalized by the number of Electoral College votes a state has. Make this map for previous elections. Use pure red (#ff0000) and pure blue (#0000ff) at the ends of the gradient instead of the colors I took from the Salon map. This will make the map a bit more accurate. It will also allow you to add green to the mix to signify the performance of that merry prankster, Ralph Nader. If you want to check my work (much obliged), here's the original bar. Arizona and Vermont look a little off to me. This document (source) is part of Crummy, the webspace of Leonard Richardson (contact information). It was last modified on Friday, August 17 2007, 22:44:26 Nowhere Standard Time and last built on Thursday, April 25 2019, 14:00:37 Nowhere Standard Time.